To Be on Google or Not to Be? Another EDUCAUSE article that caught my attention lately is Scholarly Reputations: Who’s Got Buzz? (view the HTML or PDF version) by Paul Kobulnicky that tries to remind scholars about the importance of being on the first Google screen when searched for and also the importance and value of having your work available and open online. Of course, the author underlines that having your work published in leading journals in the field is still important, but it doesn’t suffice in the age of Web 2.0. And here I must agree with Kobulnicky - we got used to rely heavily on Google when doing research and I must admit that when I read an interesting article from somebody I usually Google that person to see what else he/she has published and if I can read more from the author. And the best thing that can happen is to see the person’s website or blog among the top 10 Google search results. If that doesn’t happen I usually forget the author pretty soon, but if I do find an interesting site/blog through Google I usually bookmark it because I want to keep an eye on the author’s work and research. And this was also one of the reasons for starting this blog. My blog enables me to share ideas, opinions, research results etc. with anyone who might be interested in my work or just random people trying to learn more about the topics I write about. When I started my blog I got some concerned views about publicly sharing my work - and usually the concerns involved the fear of having somebody “steal” my ideas. However, I think that people that are interested in stealing ideas and have nothing original to say, can steal from books or journals as well. The Internet can make stealing a bit easier, but it also makes tracing original sources much easier (just ask our students that copy paste from the Internet without quoting - it doesn’t take much to figure out where the parts came from). So all in all I think the benefits of public sharing are much greater than possible threats. 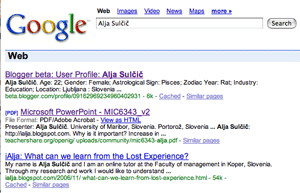 And I can happily say that a Google search of my name has my blog on the first results page. And to that I can only say: mission Google accomplished! But of course the work isn’t done here, it is in fact just starting: a web presence without content does one no good, so I have to work on providing quality content for the loyal (or random) readers of my blog :) and in such a way add my humble contribution to the vast Internet library of knowledge.